Fresh pasta is superior/preferred to dried pasta, the latter being merely a convenient substitute for the unskilled and lazy. Many times I have heard people say, "But fresh pasta is definitely better." Well, not exactly. I will start by saying that fresh pasta is a more Northern tradition, while dried pasta is a more Southerly thang. Dried and fresh pasta have two very different but equally important uses. For example, no Italian in her right mind would EVER make a puttanesca with fresh pasta (click here to read DoBianchi's excellent history on this misunderstood sauce). On the other hand, who ever heard of dried ravioli? Spaghetti/penne with fresh tomatoes would not be the same without perfectly al dente, high-quality dried pasta. There are a few indicators of quality to help you navigate a grocery isle (stay away from anything that says "noodles" unless you're making Asian food, please.) The most important is the surface of the pasta, whatever shape it may be. It must-a to be ruvido (that means rough), not like sandpaper, but a bit like the fine side of a fingernail file. This helps the sauce adhere to the pasta, clinging to the hope of making your mouth happy. Buy one of those bags of 79 cent "noodles" when you buy your good spaghetti. You'll feel the difference! The second, which reveals itself only after cooking, is the integrity of the pasta. If it falls apart when you stir it with the sauce, it is too old. It may have been a fine bag of love in its prime, but it's a sign that your grocer isn't turning over his stock. One more thing, and this is a personal preference, but I believe with my entire Texan being that all "cut" pasta (penne, ziti, rigatoni, etc) should be ridged, or rigata. There is nothing uglier than a plate of smooth penne, espesh when one or two are broken. Why have Lays when you can have Ruffles? Why would you forgo the extra fun of added texture for the flat and boring landscape of liscia (smooth)? Must we spend 5-7 dollars a pound on Rustichella d'Abruzzo to get it right? Maybe. This is terrific pasta, but this starch's humble purpose in the kitchen becomes a luxury when it should be a nutritious and everyday option. In most supermarkets you can find DeCecco, which is a fine product, though industrial, but I use it regularly. My favorite, however, is I SapORI di Napoli (this is a bit of a word-play, sapori means flavors, the capitalized ori is the plural of oro, which means gold). I found in this brand what I had been looking for since I returned from Italia. It's made in Caserta (just outside of Naples) and feels like a true artisan pasta. Please stay tuned for Part 2 where we'll talk about cooking the pasta! Weekly Wino: What the hell's wrong with Chardonnay? It's 100% Chardonnay, if you like that kind of thing. It never fails to surprise me when a "wine person" utters such nonsense. Can we please stop propagating the misguided idea that all Chardonnay is oaky and buttery and therefore bad? Please dismount the high horses, it only makes one seem ignorant to poo-poo an entire varietal for the unfortunate trends which have tainted this noble grape's reputation. I guess this guy has never had a Chablis, more southerly Burgundy, or a Blanc de Blanc...? There are even some Chardonnays out of California that are fresh and clean, fermented in stainless steel and bottle-aged instead of barriqued. 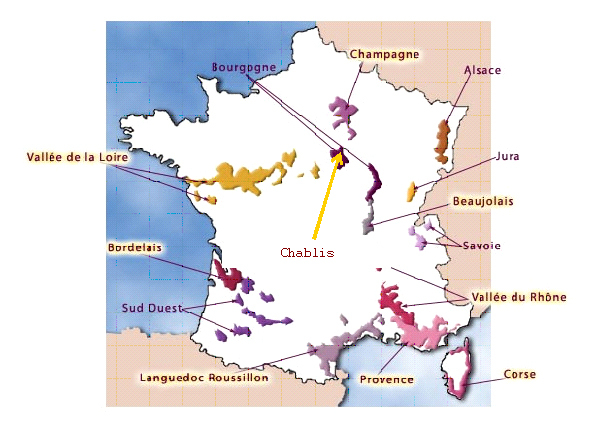 The Chablis manifestation is where one should start to understand the truth of Chardonnay. It is usually naked, nervous, stripped of make-up and a hair dryer. But it has natural beauty which shines and delights even more because it's clean. Still in Burgundy, but heading south, we might encounter some Côte de Beaune. This Chardonnay is a bit more voluptuous with its light touch of malo-lactic fermentation and kiss of oak. But eet ees zo French, done with elegance, destined for subtlety and long life. Aaaaah, and Champagne. You know how I feel about bubbles. A good Blanc de Blanc (made with 100% Chardonnay) is an effervescent delight. Grapes are picked precociously, to maintain high acidity and low sugar, much like those spunky little gymnasts who remain tiny into adulthood to delight us with back-flips and perfect dismounts. BUT...we wouldn't have a Weekly Wino without a wine, would we? The protagonist of this drama is a 2007 Côte de Lechet Chablis (premier cru) by Laurent Tribut. This wine is still a bit young, but its potential is clear and DoBianchi and I enjoyed it thoroughly on Valentine's Day. We will surely revisit this feminuccia in a year. *Do you remember the Sprite "limon" from the 80s? *bit of hazelnut...or is that graphite? I encourage you to drink more Chardonnay and this one is a good place to start. Premier cru Chablis can be relatively inexpensive so go for it! And if you are a wine professional, please speak responsibly because people do listen. This wine is available locally at Austin Wine Merchant. That's right, I done won me an award...an American Squirrel Wine Blog Award. Just look at that little guy! So thank you Sgt. Sassafrass, I am honored.